There seems to be a problem with the "Update your language preference" dialog on stackoverflowbusiness.com. When you close the dialog by clicking x, the page gets reset to the stored language preference instead of staying on the current page. Go to https://www.stackoverflowbusiness.com/uk/talent. Then open https://www.stackoverflowbusiness.com/de/talent (German version). 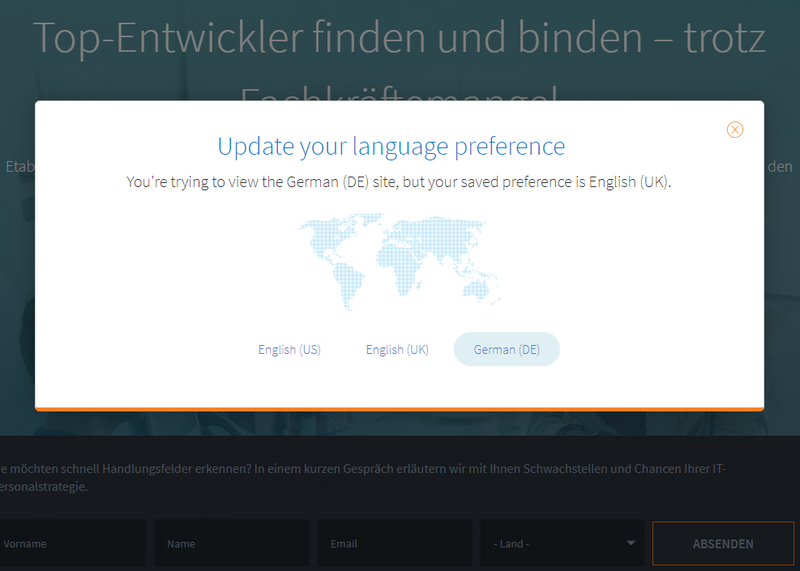 Now a "Update your language preference" dialog pops up. As one can see, the desired language (German) is already selected and the page in the background is also in German. But, when you now close the dialog by clicking the x-button, the page reloads and shows the UK page. I would expect from a page that shows a dialog that only the dialog gets closed when clicking the x-button. Especially when then desired language is already selected. Edit: I tested it under Windows 10, Chrome and Edge and on Android Chrome. Browse other questions tagged bug stack-overflow-business .